EXTRAS The arrival of an important hotel chain makes the city more recognisable and guarantees the guests a high standard and high level of service. This is fully confirmed by the InterContinental hotel in Sofia. Not long ago, the Radisson Blu Hotel was situated at the same location. After a major renovation in 2017, it was taken over by the InterContinental hotel chain in 2018. 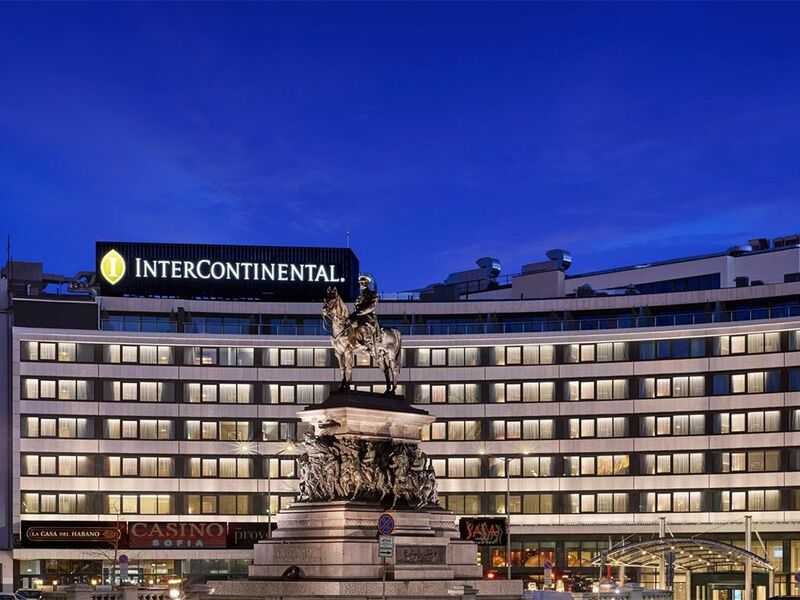 The owners of the hotel are the hotel group InterHotel Grand – Hotel Sofia AD, which also manages some other prestigious hotels in Sofia. The hotel is in an iconic city district opposite the Bulgarian Parliament, which was built in 1880 and in the immediate vicinity of the Alexander Nevsky Cathedral. For this year’s EU presidency, this part of the city has been refurbished and it now looks very attractive and above all very European. Everything is literally at your fingertips. The hotel’s location is ideal both for business guests and for independent researchers of the city. The hotel is less than 12 kilometres away from the airport and if you come to the city outside the main traffic peaks, you will arrive in the city very quickly. In 2006, the new ultramodern terminal 2 opened at the airport, symbolising the new face of the city and you can reach the new terminal by metro. Sofia has 1.4 million inhabitants and direct flights to 83 destinations, and the number of passengers and flights is constantly increasing. Taxis are very inexpensive and public transport is well organised, which is why we highly recommend it. Parking can be quite problematic in Sofia, but the Hotel InterContinental will help you with their friendly hotel concierges. The hotel literally curves round the square in front of the Bulgarian Parliament. The Modernist architecture looks fresh and attractive and seems somehow grown into the urban tissue. It seems like even King Alexander’s statue is part of a scenography. With the renovation, the has exterior remained practically unchanged, with most of the radical changes hidden in the interior. The rooms are completely renovated, as well as the modern reception and all public areas. They work calmly, elegantly and functionally. A modern fireplace in the lobby invites you to socialise, and especially praiseworthy is the intimate lighting of all public areas. Style-wise slightly more difficult is the transition to the mezzanine where there is a small conference centre that operates exclusively and nicely complements the story of the hotel. At reception you rarely meet staff as professional as the team of the InterContinental. Everything happens quickly with a high degree of friendliness and elegance, and without frequent and disturbing intrusiveness. This also applies to other staff, from service to maids. A pleasant surprise is the rich and diverse hotel breakfast. Local specialties and dishes that you can order à la carte stand out. The only negative is the slightly slow service which can cause some confusion at the tables. In this respect, the hotel has much room for improvement. The Floret restaurant, where English chef Sam McDermott reigns, is worthy of praise. He has created an interesting and very provocative menu, which we highly recommend and also quickly attracted local culinary enthusiasts. After renovation, the hotel rooms are decorated in a combination of pleasant pastel colours and grey walls, with elegant graphics. Beds are extraordinary, a tiny ethnic detail on the back of the bed inspires and the bedding is superb. The bathroom is completely renovated in a clean, minimalist style with a concrete marble washing part. The standard of equipment excites in the field of cosmetics, ironing board, Nespresso machine and everything that is the standard of this hotel chain. We missed just a slightly larger writing surface, considering the prevailing business guests. The conference centre consists of a Ballroom and four smaller meeting rooms. The capacity of the largest hall is 230 participants and is considered one of the most popular in the city. The compact conference centre is created for prestigious events and in combination with the quality of service, this is a guarantee for top-notch events. The otherwise stylish television emits light at night, which is very disturbing and cannot be turned off. It’s a triviality but can frustrate sleep. If your cost schedule permits, we recommend accommodation in Club InterContinental. With a sense for the finer details, this will upgrade your stay at the hotel. After our visit we can say that InterContinental’s Sofia operation is a great success, which in a city like Sofia is a big challenge. A lot of luxury hotels are concentrated in the city, which is a surprise for most observers from Europe. After the renovation, the hotel became a typical InterContinental. This means just enough or even plenty of space in the rooms and very good hotel functionality with precise and thoughtful hotel service. The bottom line is that while InterContinental has never been a cheap hotel, it still offers a good balance between value and price. The hotel in Sofia is a purebred Intercontinental, which will, in our opinion, meet your expectations.